One of the architectural marvels of the Rajputs is the Jal Mahal. Jal Mahal is the most serene view amidst the cacophony of the city of Jaipur. 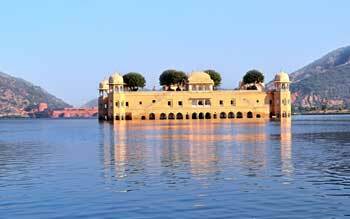 Located in the Sagar Lake, the Palace gives an illusion of floating on the Lake. The light colors of the palace is in contrast to the deep blue waters of Lake Sagar. The name of the Jal Mahal when translated into English is ‘The Water Palace’. The Jal Mahal which seems to be only one storey building actually has four submerged floors in the water. The palace has held back tons of liters of water for over 250 years. During the evenings the palace is a sight to behold as the lights from the Palace flood the deep still waters of the Lake and it appears as if the lake is set on flames. In winter many species of birds which have migrated can be seen swimming in the Lake. The sight from the Palace is that of the Aravalli hills crowned with many forts and temples is breathtaking to look at. Jaivana, Jagat Shiromani ji Temple and Kanak Vrindavan Gardens. Ideal time to visit the Palace is during October when the weather is pleasant. By road : The Palace is 5 kilimeters from the center of the city and can be easily reached by autos and taxis.